This winter sports season, O’Neal’s Director of Aquatics and Varsity Swim Coach Jen Schmitz organized a middle school swim team. Listed on the varsity swim team roster, the middle school team practices according to the middle school sports team schedule. 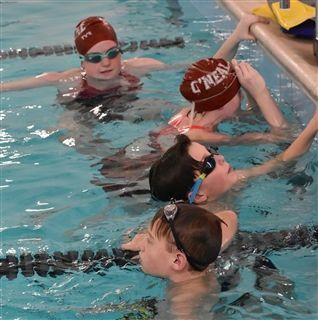 This special time with the 8-member group gives Coach Jen the opportunity to instruct in helping the swimmers to refine their form and technique in the water. 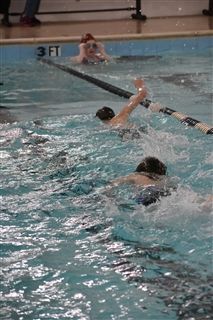 The team participates in the varsity swim meets, but as exhibition and not for varsity team points. The beauty of this opportunity is when a middle school team member develops to meet the competitive needs of the varsity team, that member can then be pulled up to the varsity team to practice and compete. O’Neal has a rich history in the sport of swimming. Since the construction of the first brick and mortar building for the school in 1975, a natatorium was included. Swimming has always been a part of the physical education curriculum. It was only natural for the school to have a swim team early on. The swimming program has been a strong competitor through the years. The girls and boys team last won the state championships in 2015. It was a repeat win for the girls having earned the title in 2014. It was important for Jen Schmitz to bring the Falcons back to the winners circle. “If we want to rebuild the varsity program and return the teams back to their state champion status, I have to provide opportunities for a middle school swim team,” states Coach Jen. Team member Holly Harp (6th grade) exclaims, “It’s great being a part of a team. I feel safe and I’m not afraid of participating in swim meets.” As an additional benefit, the swimming helps to strengthen Holly’s ankles for ballet. Falcon swimmers have swum competitively at the collegiate level for colleges and universities such as University of Virginia, Brown University, Southern Methodist University, Washington and Lee University, and Rollins College to name a few. Most recently, Ellie Henry ‘18 is swimming for the College of William and Mary. Doak Finch ’96 is presently an associate head coach for Duke University Swimming. Finch still holds high school state records earned when he swam for O’Neal. O’Neal will be offering Middle and High School Prep Sessions on weeknights over the summer. They will include of ½ hour drill sessions and ½ hour swimming sessions. Registration will open this spring and will be free of charge for O’Neal students enrolled for 2019-2020. Coach Jen Schmitz instructs how to do a proper flip turn.